Piotr and his group of Russian anglers continued their fishing holiday in Thailand with a visit to Palm Tree Lagoon. Booking the entire lake for themselves the group were soon casting out towards the hordes of fish showing in the centre of the lake. It was not long before the anglers were into the first fish of the day in the shape of a Striped Catfish. The next take was from a Giant Siamese Carp which tore off across the lake on a powerful run. After playing the carp for several minutes the fish was finally landed and estimated to weigh 25 kg’s. Several more Striped Catfish were landed in the following hour, in addition to a bonus Rohu, all falling to feeders packed with lam. 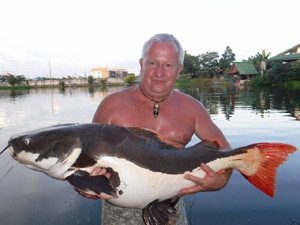 As the afternoon’s fishing at Palm Tree Lagoon progressed the predator rods started to see plenty of action with the anglers landing a series of big Amazonian Redtail Catfish with weights ranging between 30-40 kg. 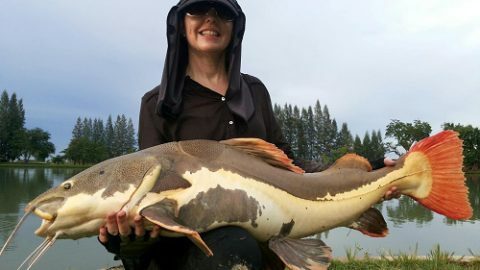 At the end of the highly productive days fishing at Palm Tree Lagoon the group of Russian anglers had landed a large haul of monster fish consisting of Redtail Catfish to 40 kg, Striped Catfish to 15kg, Giant Siamese Carp to 25kg, Rohu, Tambaqui and Yellow Catfish.